Proudly serving Morgan Hill, Gilroy, Saratoga and nearby areas. Please wait as images load. 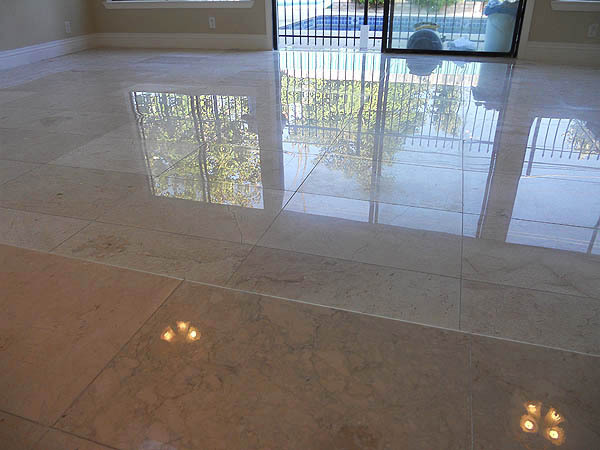 Morgan Hill marble polishing / limestone polishing. 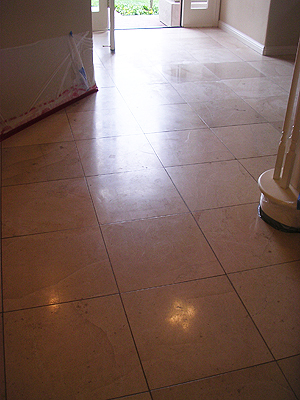 This limestone floor was restored to a medium gloss. It is important to know that not all limestones will accept a high polish. If your floor was installed in a honed state and you desire a higher sheen, we can do a test on one of the tiles to see what your options are. Some limestones simply will not have an even polish when going from a honed state to a polished one. This crema marfil marble floor had a lot of spalling before we started. Spalling is when there are areas in the stone that are deteriorating. The causes may be from previous water damage. We have also seen this condition on floors that have been crystallized. Crystallization is a process of polishing marble that makes the top layer of the stone much harder. Though this sounds like a good idea, at times it does not let the stone breath and can cause spalling. The first picture was taken after the marble floor was honed followed by filling in the spalled areas with a polyester resin (shinny areas marked with blue tape). After the polyester dried we shaved off the excess and continued honing and polishing the marble. 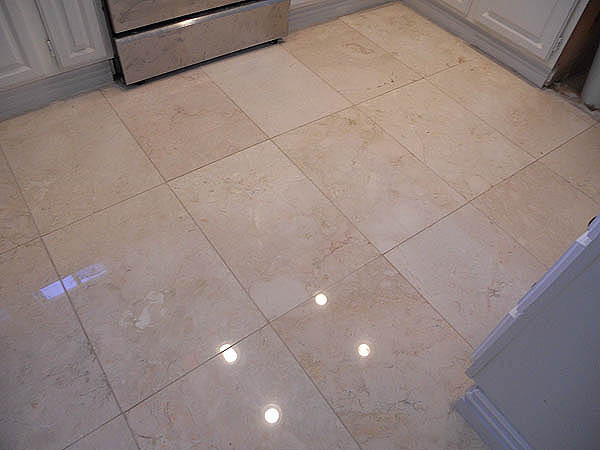 It is good to know that once stone starts to spall, there is no guarantee that the condition will not continue in other areas of the marble, travertine or limestone floor. Before marble polishing / restoration. These first pictures were taken after we ground the floor to remove lippage. After marble polishing San Jose. We also service Morgan Hill, Gilroy, Saratoga and nearby areas. 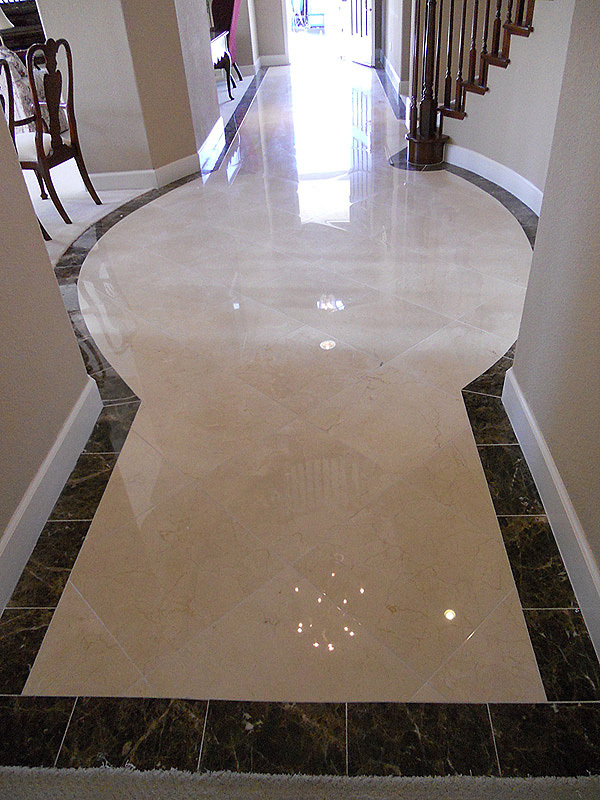 This marble floor had just been installed. The owners were not happy with the excessive lippage ( difference in height from one marble tile to the next). The jagged edges of the tiles would hurt their bare feet. There were also a lot of scratches throughout the floor right after the installation. The use of sanded grout as well as not being carefull in the installation was the reason. 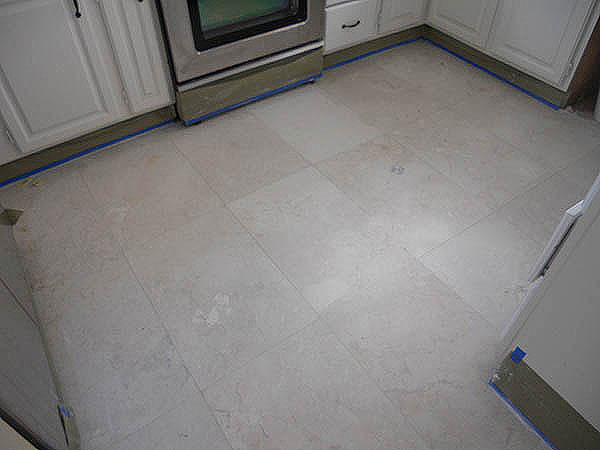 Sanded grout should never be used in polished marble, limestone, or travertine tiles. We came in and ground the floor flat with metal diamond abrasives. 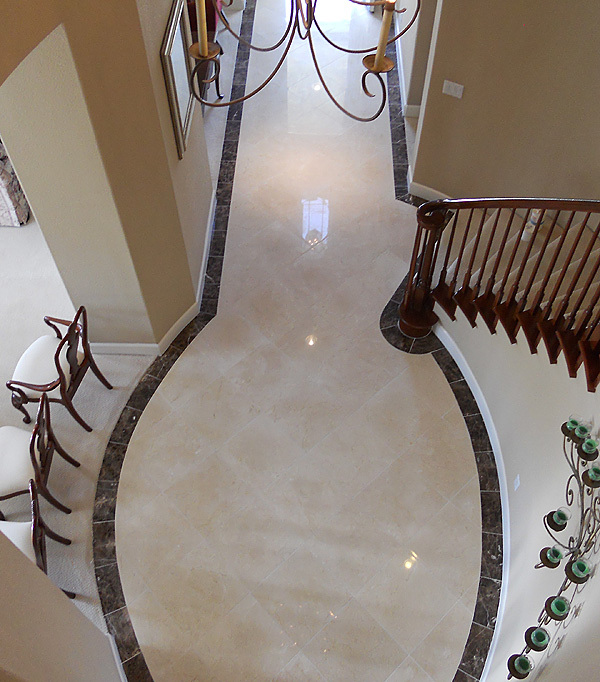 After honing and polishing the marble the owners have a floor they can be proud of. We also fill holes in travertine, marble and limestone tiles and slabs. 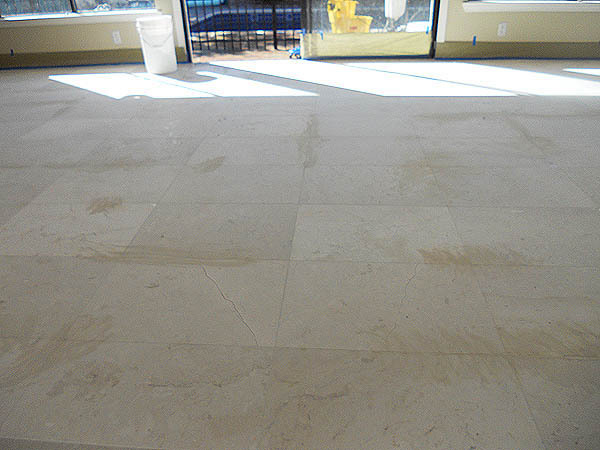 There are no before pictures of this travertine floor. On this kitchen we replaced 8 or 9 tiles that were not layed properly. After we restored the whole floor starting with lippage removal. 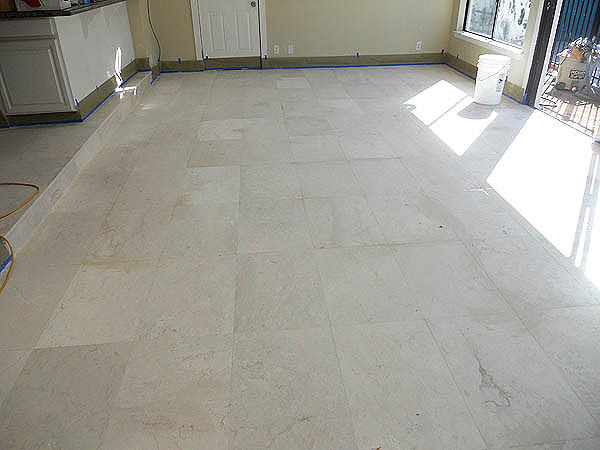 The owners wanted a satin look to their travertine and were very happy with the results. 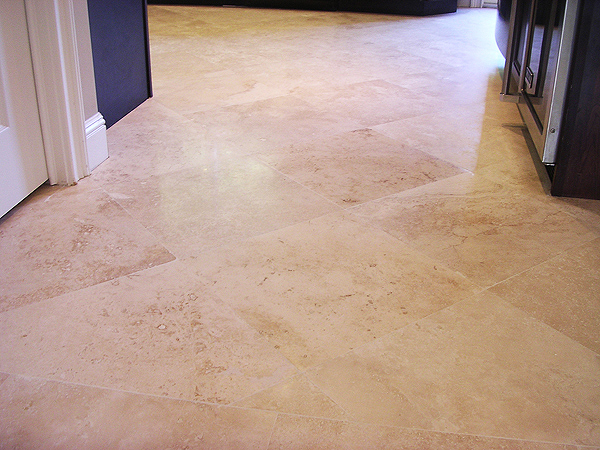 Honed travertine and limestone floors have the advantage of not showing etching as much as in a polished state. If in a kitchen or other busy area, it is worth considering this look. A honed look can vary from a flat look to a high hone that has a bit of a shine. Normally the flatter the look, the more it will hide etching and scratches. 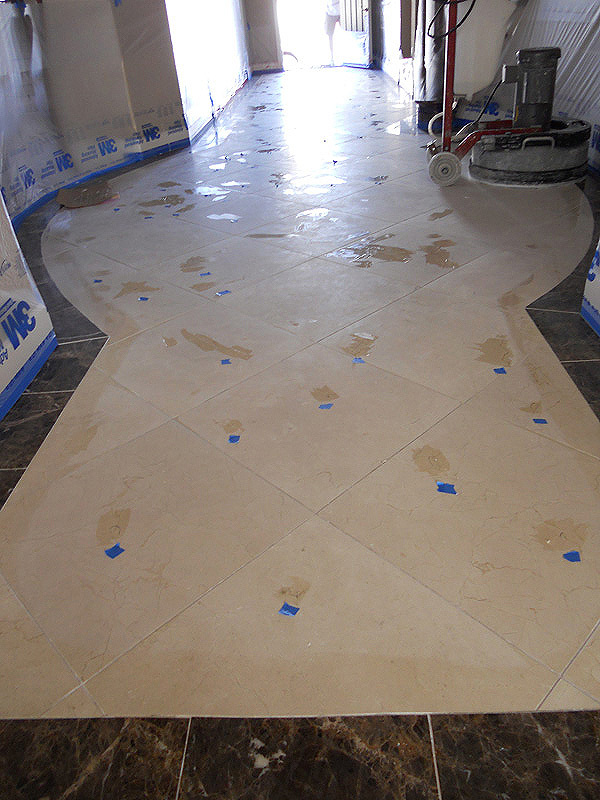 An enhancing impregnating sealer is an option that is available with a honed tile. It gives the stone a richer look without adding any extra shine. 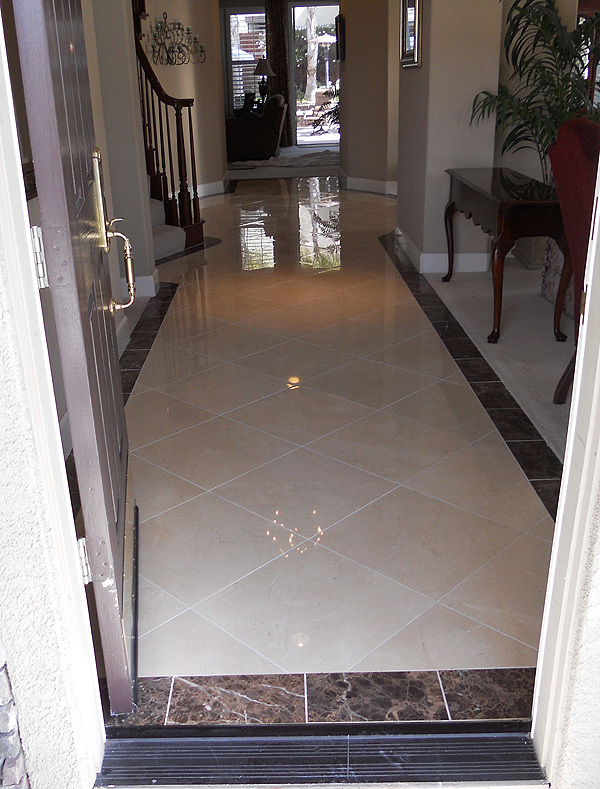 If you're thinking of changing your polished travertine or limestone to a honed state, give us an extra tile. We'll bring it back with a few different finishes. Some of the cities in the Bay Area that we serve: San Jose, Carmel, Monterey, San Francisco, Burlingame and many others. 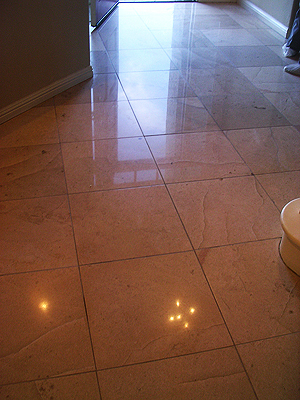 We also repair and polish Travertine tiles. Before picture of a marble floor in need of restoration. 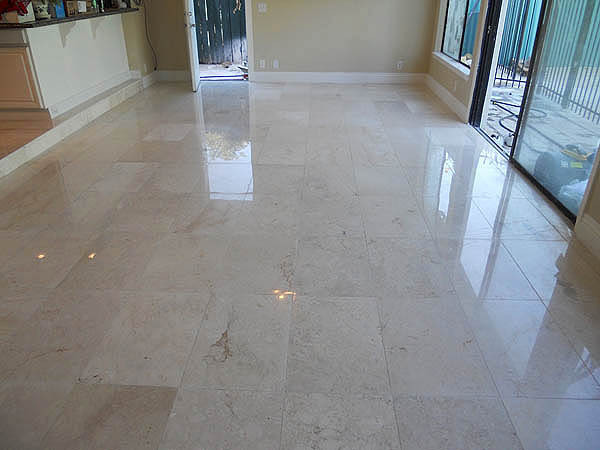 Some of our stone restoration services include: Marble Polishing, Marble Cleaning, Limestone and travertine honing, travertine polishing and others.